Imagine your business just released a product—and everyone is talking about it on social media. There are thousands of Instagram posts, Facebook posts, and tweets tagging your business and talking about the product. There is seemingly no end to the chatter. The answer: You need more context. Social media sentiment is the attitude and feelings people have about your brand on social media. It adds context to all the @-mentions, comments, and shares. It’s important for brands to listen carefully to what is being said about their business online. And even more important to know whether the talk is positive or negative. Sentiment analysis tools can help with this. Let’s take a look at what social media sentiment is exactly, the metrics you can use to measure it, and the tools you can use to improve it. That means, contrary to popular belief, not all exposure is good exposure. While you might be feeling great about the 10,000 mentions your brand got on Twitter last week, you’re in trouble if those callouts are complaints. Measuring social sentiment—often referred to as social sentiment analysis—is an important part of any social media monitoring plan. It helps you understand what someone behind a social media post is feeling. Knowing the emotion behind a post can provide important context for how you proceed and respond. Why is social sentiment important? For example, imagine your social media team is running a campaign about your brand’s new body wash—and it features microbeads as scrubbing agents. After the product’s launch, your social team notices the majority of the sentiment is negative due to the environmental impact of microbeads. Since your team paid attention to social sentiment, you can take action (removing the product from stores, making a public donation to a recognized environmental organization, etc.) and adjust messaging accordingly. Monitoring sentiment also helps the brand refrain from sharing any tone-deaf messaging. Monitoring sentiment is critical for customer service and support representatives. Public relations and corporate communications professionals need to be aware of brand perception. Using sentiment analysis, you can take the temperature of an audience before sending out any message. How? 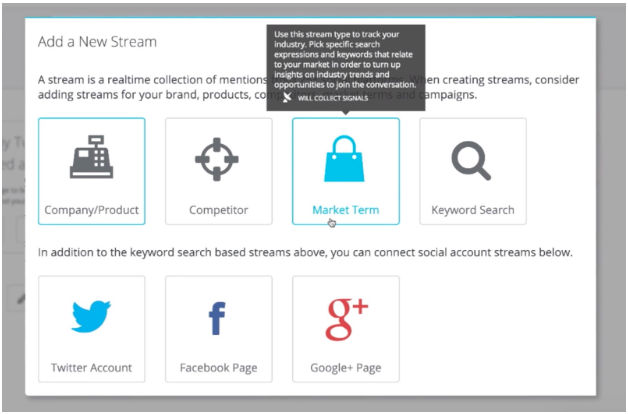 Simple: By taking a look at your competitors’ social sentiment. When you take a look at a brand with a similar audience to yours, you’re able to take a look at what your target audience responds to. Let’s say you’re a company that makes shoes. You might want to take a look at the social sentiment of brands like Nike, Adidas, or Puma to see what they’re doing to bring in positive sentiment. And, more importantly, what they’re doing to bring in negative sentiment. What types of social media posts are audiences responding to? Are they funny? Serious? Helpful? How can you emulate the posts with positive sentiment on your social account? On the flip side: What types of content receives negative feedback? What’s wrong with them? How can you avoid this in your own posts? Sentiment analysis is also helpful when monitoring keywords. In addition to seeing what the general public has to say, you can find influencers and thought leaders relevant to your industry. Say you’re researching the keyword “online coaching.” With good social sentiment analysis tools (more on this later), you’ll be able to see which influencers are championing online coaching. These are the same users who you can partner with to promote your products or services. You’ll also be able to see the influencers having positive discussions about your brand, and use this information to build relationships. 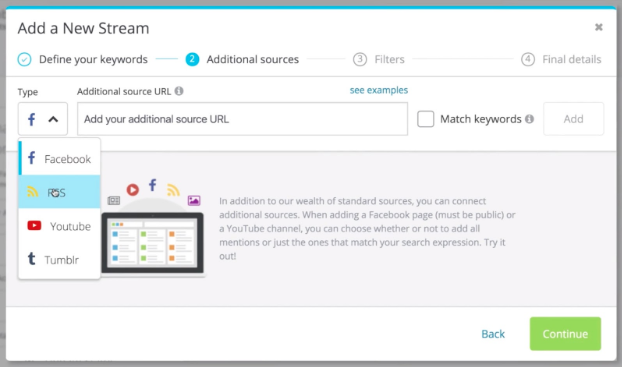 Quickly and easily filter mentions and sort by sentiment using Hootsuite Insights. You can also track sentiment by keywords and set up automated assignments by chosen keywords. You can also be sure to search for sentiment-signaling emojis, such as the thumbs up or smiley face. Digimind helps you closely monitor your social media presence by identifying and analyzing all the relevant conversations about your brand and competitors. It pulls information from more than 850 million web sources, so you know you’re getting a comprehensive view of sentiment toward your brand. You can also analyze mentions and apply filters to highly customize your sentiment analysis process. 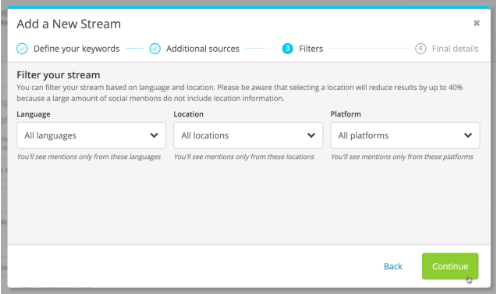 Digimind is also available within the Hootsuite app Directory and can be added to your Hootsuite dashboard. Brandwatch gives users access to insights and data from over 70 million traffic sources. Along with engagement and monitoring capabilities, you can quickly see the tone of posts and data being scanned. This allows you to analyze how certain content performs, and the type of reactions it receives. And, if you’re a Hootsuite user, you can get the Brandwatch Analytics app from our App Directory and include it in your Dashboard. Users can broaden the scope of their search and see what people are saying about their brand from all over the internet. The app even supports keyword monitoring across multiple languages, allowing you to gauge sentiment across the globe. And yes, it too is available within the Hootsuite App Directory. Rapidminer uses a specialty text mining approach to help brands conduct sentiment analysis. With Rapidminer, unstructured content sources, such as online reviews and social media posts, are analyzed, along with structured sources such as official publications and documents. This allows you to identify areas for business growth and gather feedback from product launches. The more data you have about your audience and industry, the better chance of success you have. 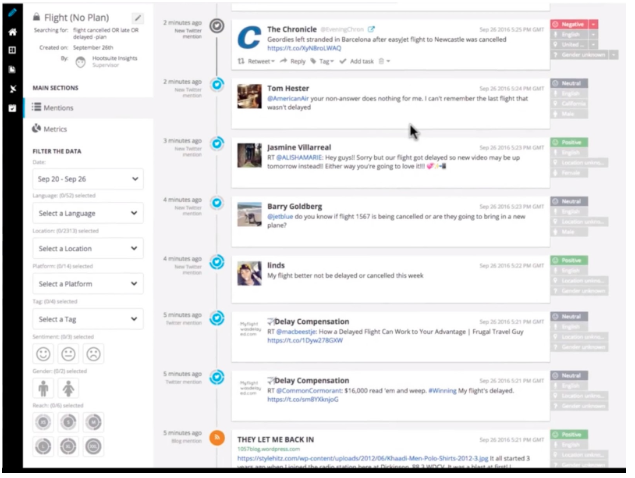 Hootsuite Insights leverages the power of machine learning to fully automate social media sentiment analysis. 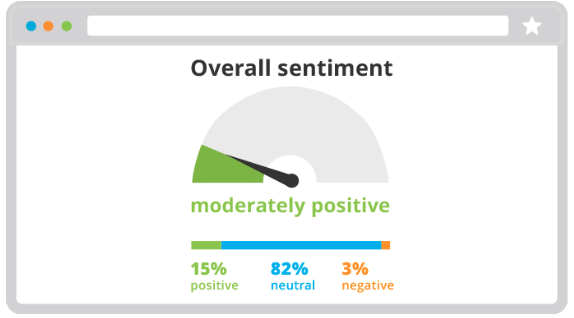 For example, if a user tweeted about shopping at Kohls, Hootsuite’s sentiment analysis tool discerns whether or not their experience was negative based on what they tweet. “Kohls has an amazing sale on right now!” would be positive. “Kohls’ customer service was awful!” would be negative. 1. 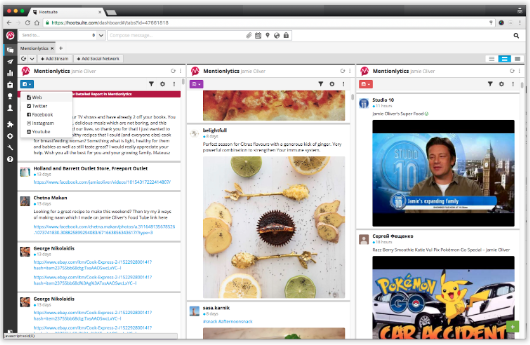 Go to the Hootsuite Insight dashboard and click on Add Stream on the bottom left of the sidebar. 2. 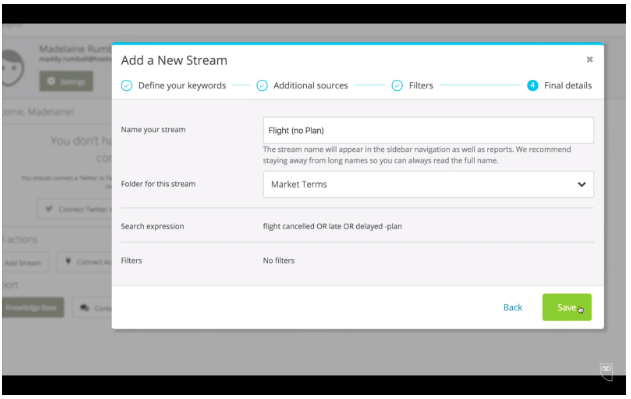 In the Add a New Stream window, select Market Term. Have ALL of these words. The posts must include the specific keywords you enter in this box. Have ANY of these words. The posts can have any of the keywords in this box—but it isn’t required that they have all of them. Doesn’t have these words. Use this box to exclude any keywords. 4. Include any additional sources you might want to pull from. This can include the Facebook Pages of your competitors or influential media outlets. Be sure to click on the Match Search Terms box as well to make sure you’re searching for those keywords from the previous step. 5. 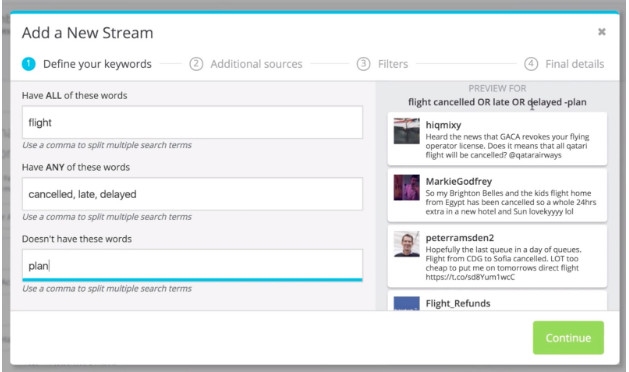 In the filter section, you’ll be able to limit your search to a specific language, location, and platform. This can be useful in certain situations such as if your company is small with an English only audience. But, in general, it’s recommended that you keep these results to all. 6. Add a name for you stream as well as a folder for where it will live. Double check your search expressions and filters then click Save. From here, you’ll be able to view the social sentiment of the keywords you chose. The results will show you whether the sentiment is positive, negative, or neutral. On the left hand side bar, you’ll also be able to filter it further by date, language, location, platform, sentiment, gender, tag, and reach. Don’t have Hootsuite Insights? What you can do instead is set up listening streams in the dashboard. 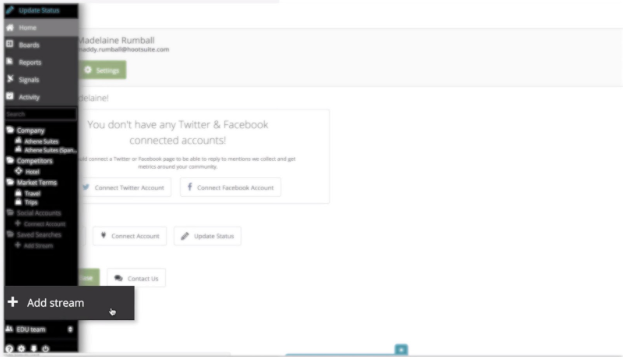 You can configure Hootsuite to receive a notification every time there is a mention of your brand with a positive keyword (love, amazing, great etc) or a negative keyword (bad, awful, terrible, etc). It’s a little bit more work because the sentiment analysis isn’t automated for you but it’s still worthwhile to do. Since one important aspect of social sentiment is responding to feedback as soon as possible, you’ll want to track your mentions on Facebook and Twitter. 1. 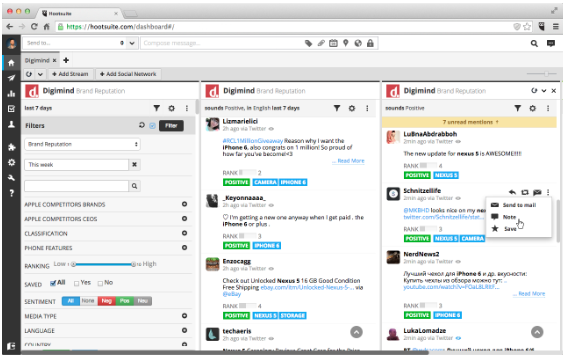 Navigate to the Dashboard, then click the network where you’d like to start tracking mentions. 2. Click + Add Stream and then select Mentions. 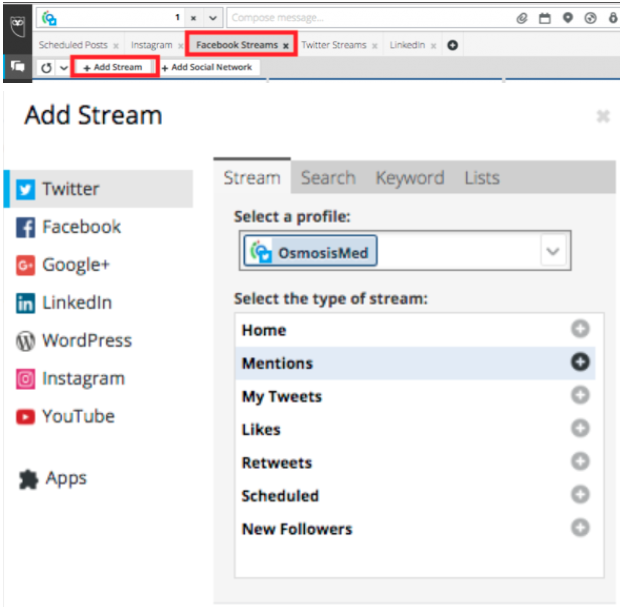 For more detailed information about how to set up streams in Hootsuite, check out this article in our Help Center. Even if you’re already generating mostly positive vibes on social, there’s always room for improvement. Builds trust. By providing content that educates and informs your audience, you can build your brand up as a trusted voice in your industry. Creates engagement. The more valuable content you share, the more your audience will engage and interact with your brand. When your audience associates your brand as a reputable source of information and knowledge, you’ll see your social sentiment rise as a result. Did you know that your social media sentiment is decided before you even fire off that first tweet? That’s because good sentiment starts with knowing your audience. When you know your audience well, you’ll be able to craft messaging that connects with them. The best part? Your audience is going to tell you what they want to see from your brand. Spend time immersing yourself in your customers’ needs, desires, and paint points. What is your customer telling you they’re struggling with? How can you use social media as a solution to their problems? By listening to your customers, you’ll be able to open up the doors for tons of social media tactics that’ll engage your audience and increase sentiment. If you really want to turbocharge you audience research, check out our guide to conducting audience research, which includes a free audience persona template. Reactive engagement. When you respond to comments, mentions, and direct messages on social media. Proactive engagement. When you make the first move and engage with other users. It’s especially helpful for increasing buzz around specific campaigns or product launches. Doing both is necessary for increasing social media sentiment. For more, be sure to read our article on social media engagement. You never want your brand to fall into a crisis—but when it happens, you want to be ready for it. When you are prepared, you can mitigate any negative sentiment that might occur or avoid it entirely. A great example of this comes from Johnson & Johnson. When it was discovered that their baby powder might have contained trace amounts of asbestos in it, the company sprang into action. They created a webpage as well as a Twitter thread addressing the concerns people rightfully had about their product. The social media team also responded to tweets and referred consumers to the informational webpage. For more on this topic, be sure to check out our article on how to manage a social media crisis. The advertisements that impact consumers the most often come from the consumers themselves. That’s why it’s so important to find and engage the influencers around your industry to help promote your brand. Hootsuite’s search streams can help you discover influencers by keeping an eye on the conversations relevant to your industry. When you find the influencers you want to work with, add them to your stream and see what they share and who they engage with. This will give you a good idea of how much of an impact they have on your audience and also gives you leads on other influencers you can work with. For more on this topic, be sure to check out our article on influencer marketing. 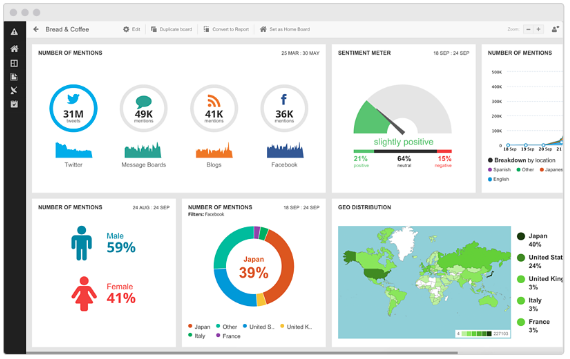 Use Hootsuite Insights to track audience sentiment on social media—from the same platform that you manage all your profiles from. Try it free today. The post A Guide to Social Media Sentiment (Includes 5 Sentiment Analysis Tools) appeared first on Hootsuite Social Media Management.